This article covers 3 free parent-teacher communication apps for Android. In today’s busy lifestyle it is hard for many parents to attend class meetings and regularly meet up with their kids’ teachers. But, these meetings are important and parent-teacher communication is necessary; after all, kids’ future is on the stake here. 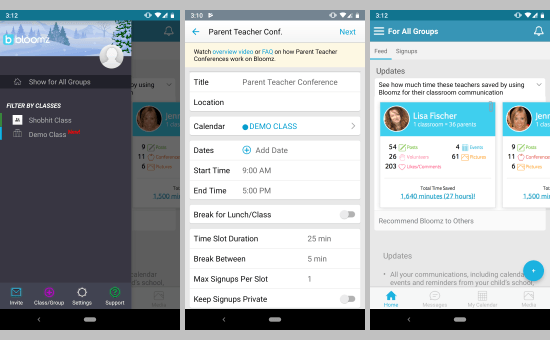 With these free Android apps, parents can stay in contact with their kids’ teachers. A school or class teacher can manage these apps to let the parents know what’s happening in school without the need for an actual meeting. Teachers can contact the parents and inform them about important meeting and school stuff. And, parents can ask teachers their queries and requests. Bloomz is a free award-winning parent-teacher communication Android app. 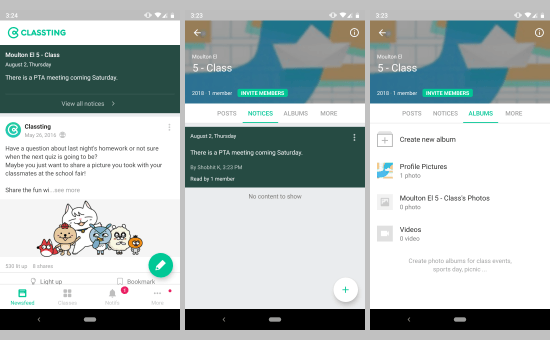 With this app, a teacher can share classroom updates, photos and contact parents through messaging. The teacher has total control over the audience of these updates. A teacher can message one or more parents without sharing their phone numbers and email addresses. Apart from the classroom updates, the teacher can post upcoming events with details for the parents. Parents can sign up for free and receive messages via SMS. With this app, parents can also reach other parents for play dates, carpooling and stuff like that. This is a great app for parent-teacher communication. This app has other school-parent communication features as well. You can download this parent-teaching communication app here. Classting is another free Android app that can serve as a medium for parent-teacher communication. This is more like a teacher-student app where parents can also be added to keep them in the loop. 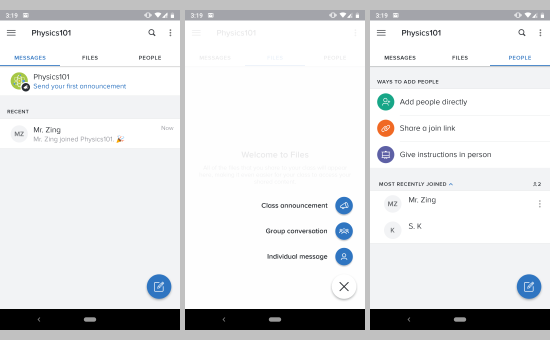 A teacher can create a classroom on this app and share an invitation code with students and/or parents and invite them to join the classroom community. After creating the classroom community, the teacher can deliver class announcements and school event via the app or SMS. Through this app, the teacher can also contact parents and have a conversation with them. The teacher can also create various media albums and share classroom photos and other updates through this app. Parents can comment on teachers posts and express their opinions. Students can also comment and debate in real time. With all these options Classting is a decent app for notifying class activities that also let teachers communicate with parents. Download this parent-teaching communication app here. Remind is a free classroom activity reminder and communication app for students. Teachers can create classrooms in this app and invite their students to join the classroom. Through this app, a teacher can post classroom activities and share photos, documents and other files in the classroom. Through this app, a teacher can deliver class announcements and communicate with parents. The teacher can message individuals or group of people and share photos. This app has a built-in translator that supports 85 languages. With all these features, this app provides a communication platform for parent-teacher communication. Here is the link to download this parent-teaching communication. These are the 3 free parent-teacher communication apps for Android. These apps can really fill the gap between the teachers and parents and provide a decent communication platform.